USA Today discusses the continuing interest in the character Zorro created by Johnston McCulley in 1919. Isabel Allende has a new book, Zorro, out this week. Play sets, graphic novels and children's books are in the pipeline. John Gertz, president of Zorro Productions, which owns the rights to the character, says he's not surprised by the latest surge in popularity. "Zorro is a superhero, in a way, but he's extremely human," Gertz says. "He has no super powers. He is Everyman made larger without having been bitten by a spider." 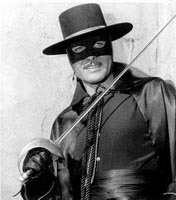 Antonio Banderas was a very cool Zorro but MY Zorro will always be Guy Williams. I can sing the theme song now. Sergeant Garcia was the best!